This space will attempt to analyze President Donald Trump’s 90-minute State of the Union in broad strokes, not touch on every detail or attempt to analyze intent. 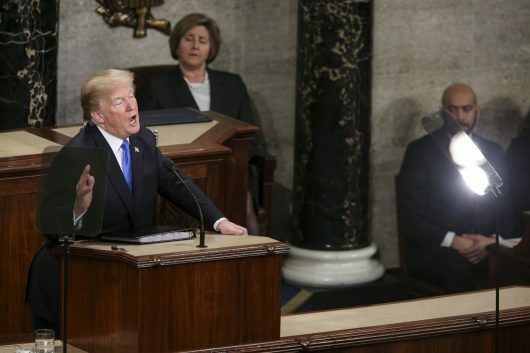 Trump for the most part avoided his usual divisive rhetoric, calling for bipartisanship, interlacing anecdotes of individuals who appeared as his guests while laying out a plan that was sparse on specific policy but cemented the goals of his administration. Trump used the opening minutes of his speech to acknowledge those recovering from disasters such as the fires in California and the storms that devastated Puerto Rico and Texas. “To everyone still recovering in Texas, Florida, Louisiana, Puerto Rico, the Virgin Islands, California, and everywhere else — we are with you, we love you, and we will pull through together,” he said. Trump’s administration has been criticized for its response to the disaster in Puerto Rico. FEMA will leave Puerto Rico one day after the speech. Trump spent a lot of time talking about the state of the economy and the job market following his administration’s landmark achievement of passing legislation that he dubbed the biggest tax cut and reform in history. It’s hard to measure if it is the biggest (and anyone involved in the Reagan administration would probably like to have a word about claiming that title), but it is undeniable that the administration signed into law a lot of long-held conservative goals on tax reform. As Trump touted his economic record, attributing the success of the economy to the recently passed tax legislation, critics have pointed out that the successes he cited are impossible to measure based on passed legislation, and many of the cited statistics are continuations of long-term trends. After outlining the economic success of the last year, Trump touched on the future of America. This portion of the speech ranged from saying that Americans should stand for the national anthem — a swipe at NFL players who have kneeled for the national anthem to protest police brutality and racial injustice — to talking up the recent rollback of regulations and increase of American energy exports. “Faith and family, not government and bureaucracy, are the center of American life,” he said. A lot of ire was focused on the national anthem comment, an issue Trump has been vocal about for months, for it was the closest thing to an open attack during the address. As far as energy exports, the United States is exporting at a level not seen in decades due to regulations being cut, but experts have said America will not be a net exporter until the 2020s. Trump, as he has done since he entered the primaries in 2015, railed against “unfair” trade deals and promised better ones moving forward. The fairness of trade deals is subjective to one’s views of international relations, but this continues his rhetoric against agreements like the Trans-Pacific Partnership and North American Free Trade Agreement — deals that have been attacked on both sides of the aisle. Trump called for solutions to infrastructure problems throughout his presidential campaign and made a concrete request to Congress on Tuesday asking for more money to be appropriated for this purpose. Failing infrastructure has long been identified by politicians from both parties as a serious issue, but Congress has never been able to get a piece of legislation across the finish line. The Deferred Action for Childhood Arrivals program, commonly referred to as DACA, was not specifically mentioned, which was somewhat of a surprise, because it has been a heavily contested issue in politics recently, but Trump did lay out a four-pillar plan for immigration reform. The likelihood of immigration reform is uncertain. Critics have pointed out that the visa lottery is not random, but does have requirements, even if they are not as stringent as the merit-based system conservatives have advocated for. Trump lent his support to those struggling through opioid addiction, but did not lay out a specific policy proposal, other than mentioning lowering prescription drug prices. Politicians on both sides of the aisle have been working to fight this issue for years now and how and if it can be solved will be a problem that continues to persist for the foreseeable future. Your article arrived in my Google Alerts mail. I took the time to read the entire article and was pleasantly surprised to read a true “news” article and not a biased post where the writes/organizations prejudice was included. Thank you again. I have saved “The Lantern” site and will return frequently.